It’s not very often that you hear the words “moving” and “fun” in the same sentence. Most people are far too concerned with getting through their move in one piece much less having fun while they’re doing it. But the first step in having fun with something is to first reduce the stress associated with it. Far too often, people overcomplicate their move. 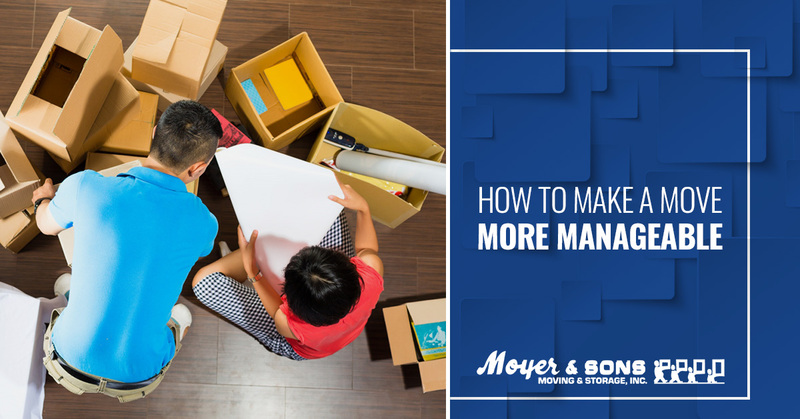 In this blog, we’re going to attempt to take it back to the basics and make your move more manageable. Whether you’re moving your home or your office, you’re going to need a checklist. I’m not even talking about a checklist of items in your home, I’m talking about a checklist of goals you need to accomplish before you can move out. This includes things like communicating with your employees, scheduling a date with your mover, and changing your mailing address. The number one cause of stress is procrastination. Even the simplest tasks can become stressful if they’re put off long enough. That means starting early on your move is your best chance at having fun doing it. One thing many people don’t realize is that packing is one of the hardest parts of moving. Why? Because you usually don’t have the right amount, size, or type of packaging materials necessary to move. This leaves you scrambling last minute to get what you need. At Moyer & Sons Moving & Storage, Inc., we are proud to provide both our residential and commercial customers with moving supplies, saving you the time and money of going out of your way to get it yourself. In some cases, it doesn’t necessarily matter what your plan is, it just matters that you have one. This is often the case when it comes to packing and organizing for your move. You need to know what you’ve packed in each box or bag, but how you do that is up to you. Some people like to write directly on the box what each one contains while others like to use apps that allow them to manage the entire moving company. The most important step you can take to make a move more manageable and less stressful is to hire a full-service moving company. Full-service moving companies like Moyer & Sons Moving & Storage, Inc. offer packing, loading, storage, and delivery services. This is important because it takes more weight off your shoulders and allows you some breathing room in case something were to not go as planned during the move. Imagine being halfway through a move and finding out you need emergency storage. If the moving company you’re working with doesn’t offer them, you’ll have to go out of the way to figure something else out. Many storage companies are completely booked out, so you may be out of luck. Ready to get your next move started? Call the moving experts at Moyer & Sons Moving & Storage, Inc. today. Moyer & Sons Moving & Storage Inc.
© 2017 Moyer & Sons - Do not copy. All rights reserved.